In the most “Well, duh” news you’ll read this week, Moto2 rider Romano Fenati got dumped by his current team and, most likely, the team he planned to run for in 2019 after grabbing another rider’s brake lever while racing. As it turns out, deliberately putting the safety of others in jeopardy has repercussions. Imagine that! The incident happened at the MotoGP San Marino Grand Prix in Italy this weekend, where Stefano Manzi and Fenati raced for position in the second-tier Moto2 race. 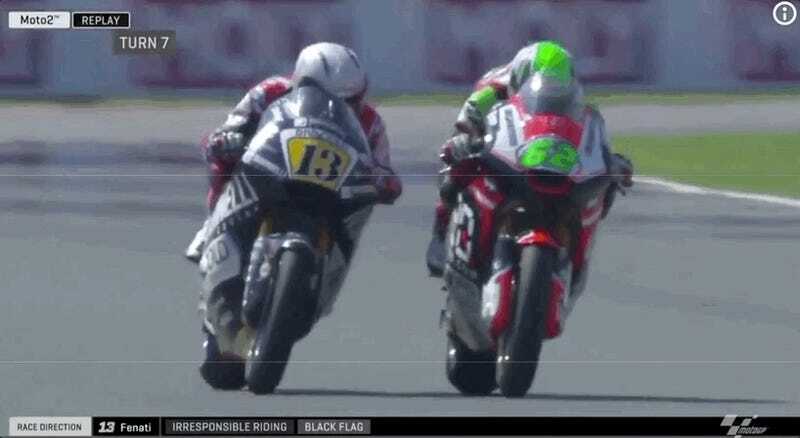 They both eventually ran off track, but kept right next to each other—until Fenati got ahold of of Manzi’s brake lever. 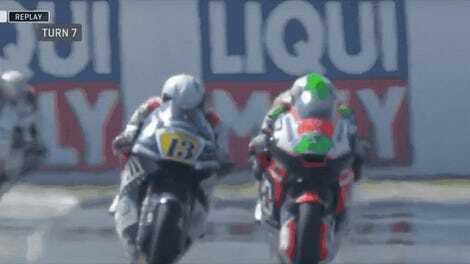 Manzi lost control of his bike and later crashed, while officials gave Fenati a black flag and a two-race suspension. With extreme regret, we have to note that his irresponsible act endangered the life of another rider and can’t be apologized in no way [sic]. The rider, from this moment, will not participate anymore to a race with the Marinelli Snipers team. The team, Marinelli Cucine, Rivacold and all the other sponsors and the people that always supported him, apologized with all the World Championship fans. Not only will Fenati not have a ride with his former team when his suspension is up, but he seems to ruined his Moto2 deal for 2019, too. Fenati planned to race for MV Agusta in 2019, but its president, Giovanni Castiglioni, said on Instagram that he’ll do everything he can to stop that from happening. This has been the worse [sic] and saddest thing I ever seen in a bike race. True sportsmen would never act this way. If I would be Dorna I would ban him from world racing. Fenati, who Reuters reports kicked out at another rider during a Moto3 warm up in 2015, has had a bit of time to think about his actions and get canned from his racing commitments, so he’s naturally very sorry for all of it. Fenati posted a statement on Monday in Italian, saying, translated via Google Chrome, that he apologizes “to the whole sports world” for what happened. The statement said with a clear mind, Fenati “wish[es] it had been just a bad dream.” Manzi probably does too. Fenati said he “made a disgraceful gesture,” and that he was “not a man.” He said he shouldn’t have reacted, and that he understands the resentment toward him after he, uh, put someone in danger. I want to apologize to everyone who believed in me and all those who felt hurt by my action. An image of me and of sport has come out, everything, horrible. I’m not like that, who knows me well knows! It’s true, unfortunately I have an impulsive character, but my intention was certainly not to hurt a pilot like me but I wanted to make him understand that what he was doing was dangerous and that I could have made some mistakes as well as he he had just made them to me! I do not want to justify myself, I know that my gesture is not justifiable, I just want to apologize to everyone. Now I will have time to reflect and clear my ideas. Fenati will have time to reflect, too, since it doesn’t look like he’ll have a bike to ride in Moto2 for at least a little while. Update: Tuesday, Sept. 11 at 9 a.m. ET: Fenati is out at MV Agusta, according to Autosport. He was also reported to the Rimini Public Prosecutor’s Office by a consumer-rights group to be investigated for attempted murder.